Inspired by all the local tweeting about Blackbird Farms from local foodies & restaurants, and the fact that the farm is down the street from where I work, I stopped by their new farm stand last week. What I saw got me very excited! It’s a very small farm stand sitting in one of the farm’s pasture at the corner of Limerock Road & Douglas Turnpike. The tiny hut contains one cooler, one freezer, some space for a few vegetable boxes, and a small cash register. That’s it! The real magic is inside that freezer. HUGE steaks of grass fed beef (several cuts), large (and small) roasts, and some very nice looking local pork. In the cooler there were some convenience items then cartons of their fresh eggs! Unfortunately I only had $13. on me, otherwise I would have gone to town! Perhaps it worked out for the best actually. Instead of several large Ribeyes I ended up with (3) packages of pork chops. Each package was in the $4 range which I thought was very reasonable. I mistakenly believed each package to contain one large chop, but there were actually two chops per package, but they were still a good size. 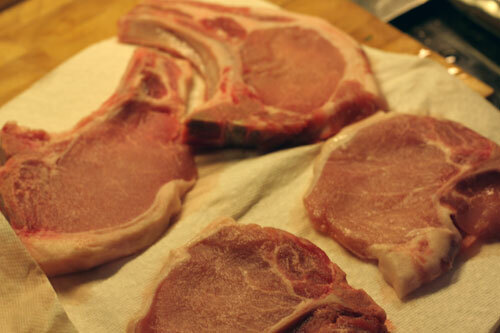 While still at the farm stand my mind was already racing to figure out how I was going to cook these chops, and what to serve them with. As usual that’s half the fun! 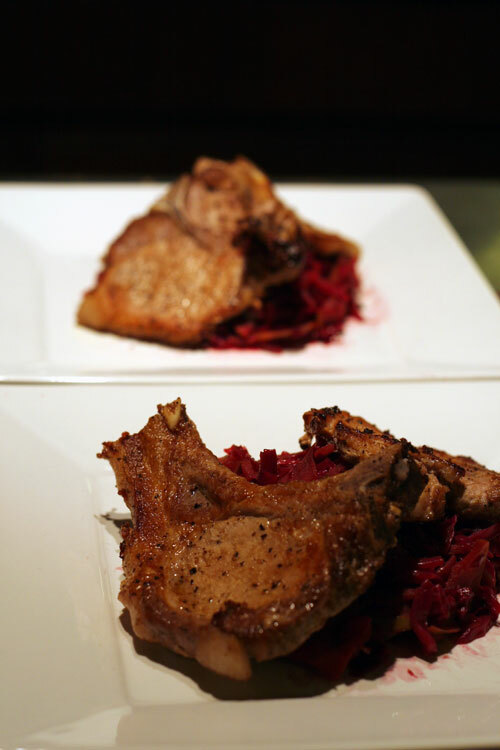 I’ve always loved the combination of pork with apples, and with the weather starting to lean more towards fall I was also thinking about cabbage and more hearty fare (it’s stoemp weather as they say! They do say that right?!). 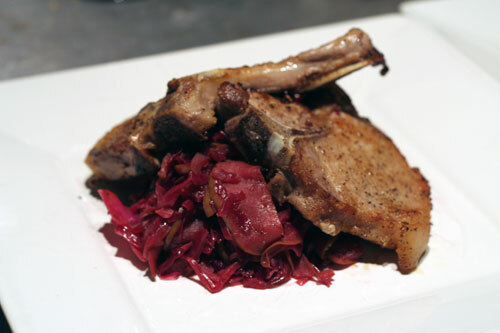 The end result was pan fried pork chops with red cabbage and apples. I chose to pan fry the chops to keep it as simple as possible. Since this was my first encounter with Blackbird Farms pork I wanted to make sure I could taste the meat and nothing else! So keep it simple I did. I thawed them out, removed them from the packages, and patted them dry. Afterwards I liberally salted & peppered them on both sides and that was that. 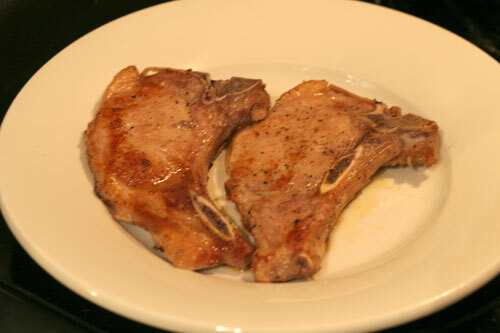 Next, I heated the pan, added some olive oil and browned the chops on both sides so they were still slightly pink in the center. 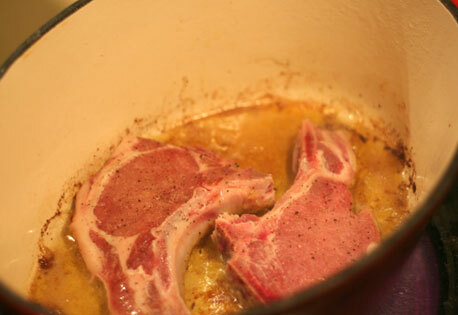 In the pan I used to cook the pork chops (some nice fond at the bottom, and very flavorful oil!) I added the onion and cooked them until they were nicely browned/caramelized. I then added the garlic and continued to saute for a few more minutes then added the brandy to finish deglazing the pan. 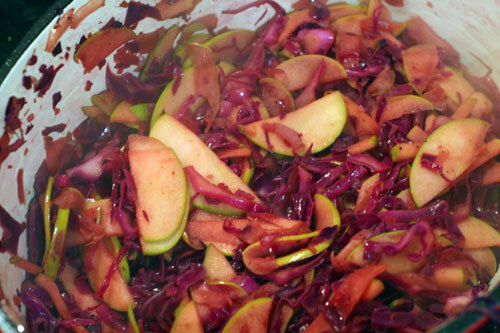 Next in was the cabbage and apples which I sauted for another 10 minutes or so until both were soft. At this point I added a little honey, and the beer vinager which gave it a nice sweet & sour component. This continued to cook for another 5 minutes or so. One final taste at the end to make sure it was seasoned properly with salt & pepper and it was ready to plate!